Bring the Restaurant to you! Save Money, Time, and Eat Healthier in 20 Minutes. Ever wander around the grocery store wondering what to eat and end up with a hodgepodge of random ingredients that lead to nowhere? 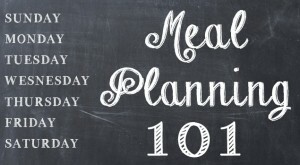 A weekly menu plan will solve that problem. To start a menu you need to decide what you want to eat. You probably have family favorites that you make often; Maybe you saw a recipe in a magazine or on a cooking show you want to try. Start keeping the recipes you make in a collection somewhere for reference, could be a binder of printouts or a DropBox folder, or Evernote.. I suggest you ask your family for input with this so there is less complaining later. You should aim for 10-20 dinner recipes. We are creatures of habit, most of us eat the same foods repeatedly. Once you have your list of family favorites, pick 5 for your first meal plan. 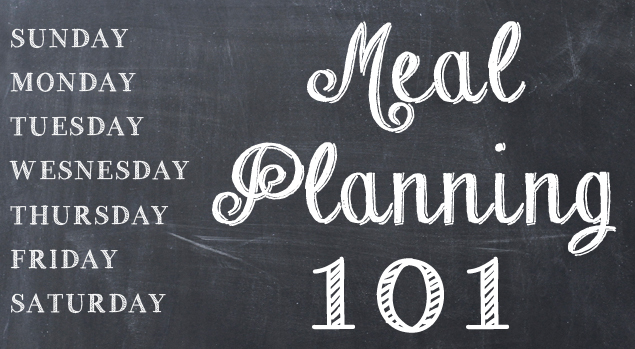 Include breakfasts and lunches through the week to the menu plan. Don’t forget snacks, fruit, drinks, etc. This allows flexibility for dining out or Sunday dinner at grandma’s house. Convert your menu plan into a shopping list organized by categories (Dairy, Meat, Produce, spices, etc.) This will keep the backtracking to a minimum so you can get out of the store faster. Lastly, before you go shopping you need to know what you have already in your cupboards or pantry so you don’t overbuy. Do a quick tally of what you have and cross reference your list to make sure you don’t bring home a 3rd jar of mayo or add to a growing supply of rice. Just wanted to thank you for the wonderful dinner you put on in our house last month. Our friends George and Lesley and Rick and I really enjoyed everything that you prepared. I am sure that you will be hearing from us again soon. It was such a pleasure to have you prepare dinner for us and the food was to die for. Hey Jason, Just wanted to thank you again for an amazing dinner. It definitely exceeded expectations. Lana was definitely surprised and very much enjoyed.Cheers, John. The wonderful aroma greeted us at our door as we returned from a family golf tournament. I had Jason prepare several dishes to remove the unwanted pressure of entertaining 28. Our kitchen was clean, the food was prepared and fully cooked allowing us to spend valued time with our family without any headaches or hassles. Jason was a delight to work with and I would highly recommend his services. The food amazing! I have to admit, I was a bit nervous about having someone in my house cooking an elaborate birthday dinner – usually I’m the one to handle such preparations! I had no need to worry. Not only were your recommendations for the evenings menu amazing (particularly the appetizer seafood trio) your suggested wine pairings with each course helped make the evening that much more spectacular. I will say the grand finale of the whole evening – the “icing on the cake” literally was the gorgeous old fashion Chocolate layer cake! We are still talking (or drooling!) about how fantastic that cake was! Beyond the food the service was wonderful as well. I felt like we were in a restaurant in my own home – and with much better service (really undivided attention!) than most restaurants can provide! Not just me, but my guests as well would highly recommend your services to our other friends, family, and colleagues. I would not hesitate to be a “reference” for you for other potential clients, and look forward to using your services in the future. Just a note to let you know how much we all enjoyed our anniversary dinner Sunday night and the leftovers were just as good the next night. Everything was deliciously prepared and the presentation was great. I wanted to take the time to let you know how much we absolutely loved the meal – you made an extraordinary dinner and we have not stopped talking about it since! The smell of your magnificent cooking is still slightly in the air – thanks again! After much deliberation on what to do for my husband’s 40th birthday I stumbled across Jason’s web site. How lucky! I will admit it was with trepidation that I hired Jason (after all, I got his name off a website) but I found him to be pleasant on the phone and very professional in the planning of my event. I’ve had many parties in the past but none went as well as this one. I owe the success to Jason and his staff. They arrived on time, set up in a timely and tidy fashion and got straight to work. The uniforms worn by all staff members were an elegant and professional touch. The food was stupendous both in taste and presentation and it was set forth during appropriate intervals throughout the evening. The attention to detail was incredible. I truly did not have to lift a finger all evening and was therefore able to mingle with my 70 guests while Jason “Taylor’d the taste” of every guest with class and personality. I highly recommend Jason for an occasion and look forward to another memorable evening hosted by him and his staff. Fantastic job Jason! Thank you for coming on such a stormy night to make dinner. It more than met my expectations. The dinner was really lovely and I really enjoyed myself. The experience was so much better than going out for dinner and the food was wonderful. We just had Jason prepare our Christmas Holiday Dinner for eight last Friday. This was a treat for my wife and friends as it allowed all of us to simply relax and spend a wonderful time together. As Jason says, he does it all, stress-free. The kitchen was spotless after he left. With only 2 days notice from our end, we were thoroughly impressed. The aromas were exquisite and the dinner was of 5-star restaurant quality. We can’t say enough, but you must hire Jason for yourself to really find out what you are missing out on. You will not regret having him as your personal chef. We will definitely be doing this again! Hi Jason, thank you very much for catering our staff Christmas party. You did a wonderful job. The food was amazing! You created a beautiful menu for us that fit our budget. I also enjoyed watching you prepare our meal. You are a chef extraordinaire! Jason created a lasting memory of tantalizing aromas and extraordinary tastes. Many thanks to you Jason for a unique and enjoyable fine dining experience. We just wanted to say Thank You for the lovely dinner we had last Friday. We enjoyed it very much. Your work is amazing! You really made our date night wonderful! Hi Jason, the evening was a big hit, everyone had a great time. We all thought the meal was fantastic and happy we went with the risotto. Thanks for making it a special event, we continue to get feedback from people that it was one of the best meals they have ever had. I’ll recommend you any day and I’m sure we will use your services again in the near future. Jason, my family still talks about the meal you made for us 2 years ago!! It was so good. Jason catered my husband’s 50th birthday party. The numerous hors d’oeuvre platters were sensational. My guests enjoyed all the different taste sensations. Jason did a wonderful job of preparing everything and assembling the food items on the various serving platters.He really made my husband’s 50th a very special day. I would certainly recommend his services. Hello Jason, I have finally recovered from the party. I want to thank you for a wonderful job. I am sincere when I say I could not of done it without you. Your food & service was great, and made for a nice worry free evening. It was a comfort knowing that I had someone to take of all the food, serving, and clean up. I recently hired Jason for his meal planning and preparation service, and was thoroughly impressed. The quality, taste, and presentation of each meal far exceeded my expectations and everyone raved about the variety and flavours. I will definitely be calling him again, and would not hesitate to recommend Jason to my friends and colleagues. We get together every year around Christmas time with 12 of our good friends. This year was our turn. Being full time working parents, with two young children with very busy schedules, we were limited with time to prepare and organize such an event. I was so worried about how I was going to be able to accommodate 12 adults and 5 children with such limited space. Jason was very helpful with all the aspects of the preparation. He took care of all the shopping, preparation, table service and spotless clean up! We can not even begin to thank Jason enough for such a wonderful experience that allowed us to enjoy a stress free evening with our friends. The food was Absolutely Heavenly!!! All we can say is that we highly recommend you to try Taylor’d for Taste and see for yourself. We definitely look forward to having Jason back again on future occasions. Everyone loved your last BBQ. You know it was a success when everyone is taking the leftovers home and I have to hide a few sandwiches for Justin and I to eat later. Honestly, I’ve never seen anything like it before. Thanks again for making such a great meal. I can recommend Jason Taylor with absolutely no reservations. He was a pleasure to have as our personal chef, very customer-oriented in everything he did. He took care of the shopping, preparation, and cleanup, and provided excellent and interesting fare for our dinner event. Jason also fielded several questions from our most inquisitive children, who were fascinated with the preparation process. This was our first time using a personal chef, and also the first time we were able to really relax and just enjoy our guests. Jason met all our expectations, and we’ll definitely be asking him back. Jason prepared a fabulous dinner for my wife and I on Valentines’s Day. Jason helped me with the menu selection and came up with some amazingly healthy dishes for our 4 course meal. Suffice to say, we were both full and enjoyed a lovely meal with some great insight into the meal preparation. Thanks Jason!…I might need to attend a cooking class of yours! All of our guests have left and they were raving about dinner all the way to their cars! Thank you again for such a wonderful meal- it really made the day extra special. I’m sure my father in law will be describing it for weeks to come! Doug and I thoroughly enjoyed the dinner on Friday. You did a wonderful job of cooking, serving and cleaning up. What a treat for all 8 of us to sit in the comfort of our friends home and enjoy a fabulous meal! I really loved the shrimp and avocado/corn salsa appetizer, it was my favourite. I could have made a meal out of that alone. We have your card and I have no doubt that an occasion will pop up that will be perfect for having you come to our home to share your culinary skills.Thanks again! Our friends are still talking about the great evening they all had (12 of us) at our house. We were all very impressed with all the wonderful food you created for our sit down dinner. You made us all feel very special, you were very informative and professional, and will not hesitate to recommend your services to anyone. We will definitely be doing this again ! Thank you again Jason for being so patient with us in organizing the menu, from all the appetizers to the dessert, it was truly a wonderful evening that we will never forget. For our wedding rehearsal dinner Jason Taylor was very professional and helpful. He gave us lots of suggestions in order to suit the very diverse palates of our guests. We gave him a budget, and he helped us choose menu items that were delicious, easy to eat (for the buffet-style dinner we’d planned), and suited both vegetarian and non-vegetarian guests. Shopping for and preparing the meal took away a lot of stress for us both! The night was a great success, and everyone commented on how good the food was and how well it was prepared. We would heartily recommend Taylor’d for Taste for any function or dinner! Hey Jason, Thanks so much for an amazing 40th bday party. I absolutely loved everything you made and I have received so many compliments on the food…so thank you. Thanks for making my bday very memorable!! Thanks for a wonderful tasting experience at Donna’s on Sunday. I loved every bite. You truly have a gift for food preparation and presentation. Our whole experience was professional and easy, right from the initial email contact. You have great attention to detail, created great flavour combinations and presentation, and the timing between courses was perfect – we were relaxed and able to fully enjoy the meal and our company. We LOVED that you cleaned up so completely before you left – we were not expecting that! !, it really made it an evening to be pampered. Imagine not having to wash dishes after someone else cooks you a fabulous meal! I would absolutely recommend Jason and his catering services. I just wanted to drop you a quick line to thank you for everything you did for us on Saturday. Your service was fantastic and even more importantly the food was unbelievable! I’ve passed your name out to a few friends and will continue to do so. Thanks again for a great night. Jason: just wanted to let you know how much we enjoyed our dinner last night. You really teased our palettes with the variety of flavours. Also, I really enjoyed the opportunity to sit, watch and talk with you as you were preparing the meal. My family was celebrating its 4th milestone in 12 months and it was getting a bit difficult to think of something fun and original to do to commemorate this 4th event. This is how the idea of having a professional chef at home came about. What a wonderful experience we had! Jason proposed several choices for each of the 4 course meals, making it difficult to make a decision. He did all the shopping, favouring seasonal fresh produce. He came home, cooked, served, and cleaned. The meal was exquisite and delightful. The presentation was tantalizing and the service impeccable, not too fast, and not too slow. What a night to remember. My family is now looking forward to the next milestone to have Jason cook for us again. I highly recommend treating yourself, your family or your friends with a delicious meal worthy of the best restaurants, prepared by Jason in your own home! Hi Jason, just a quick note to say thank you for yesterday…just amazing how that amount of food came together in such a small space, must have had a few “kitchen elves” in there when we weren’t looking!!! Everything was delicious..by the way may I ask for your recipe for the spinach and gruyere frittata, I could have eaten the whole thing myself and I loved the way it was served. Hi Jason, Thank you again for a spectacular night. I thought the food was fantastic. Everyone loved it. Especially your Lobster Thermador and I thought the creme brulee was pretty outstanding. Everything was great. You guys did a great job cleaning up and I thank you. Hope to see guys again and again, Tonie. When looking for a caterer for our our small country wedding, my husband and I were referred through a friend to Taylor’d For Taste, where we met Chef Jason Taylor. With his easy going manner and great sense of humour he put our minds at ease. When the day of our wedding came Jason and his great team took care of everything. Jason was able to creatively offer us several delicious options while catering to a list of food allergies. Jason’s personality and professionalism was top notch and the food was amazing. Thank-you Jason for you scrumptious food, professionalism and integrity, We thoroughly enjoyed you and your team preparing our meal for our big day and are happy to highly recommend Taylor’d For Taste. Hi Jason, thanks again for a great dinner last night. We really enjoyed your company and your cooking!!!!! See what it's like to have a Personal Chef in Your Home.